Serena Williams may have returned to tennis just recently, but she can’t wait to get her hands on fresh Major trophies. The American tennis superstar, who made her competitive comeback last month after giving birth to her daughter Olympia Alexis Ohanian, is a winner of 23 Grand Slams – just one less than Margaret Court’s all-time record. And despite age catching up, the 36-year-old has said retirement hasn’t hit her thoughts yet. “I feel like there is one day I am going to wake up and I am going to say, ‘I’m done’,” Williams told Bloomberg Business, as quoted by Express.co.uk. She continued: “I will know the feeling and I don’t have that feeling yet. I set my goal for just what was in sight, and I think subconsciously, a lot of people set their goal on what is already there. Why not reach for a higher goal? “And so, I really learned from that that yes, Margaret Court has 24, but why would I want to reach for that when there’s more, and so that conversation really helped me. 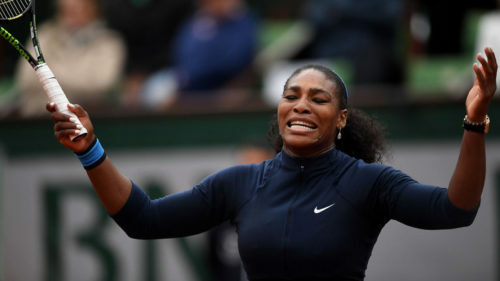 Meanwhile, Williams, who has split her four matches since comeback, is now scheduled to play the Mutua Madrid Open that begins in May first week.